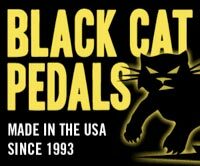 For Musicians Only: Shop Cat! Well, I finally brought my cat to the shop. After months of being neglected at home, I decided to try bringing her to work with me. She loved it! Not only that, but she was a big hit with the crew - Greg and his wife are cat lovers, and Sara has been begging me to bring the kitty to the shop for months. So, we have a shop cat. And here she is... This is Delia (better known as Baby Kitty), our new shop cat. I've actually brought her several times over the last couple of weeks. She made herself right at home. 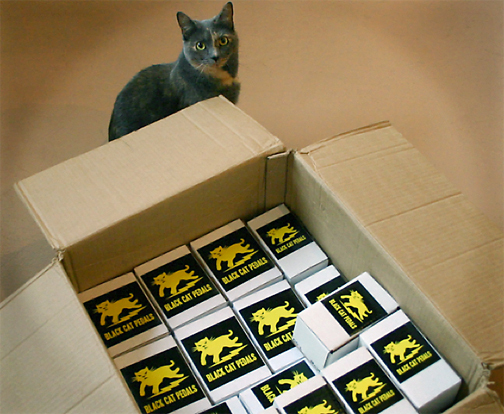 Here you can see her putting herself in charge of Quality Control for this order of Black Cat Pedals that's about to be shipped to Japan.